When Churchill met Lincoln. Naked. Anyone can tell a ghost story. Just throw together a lonely stretch of road, a couple of idiotic teens, and a disappearing hitchhiker. It's harder to make a ghost story that's drenched in historical significance, is clothing-optional, and ends with a Churchillian sting. But it happened. Supposedly. The White House is too modern, too clean-scrubbed, and a little too much like an office building to be considered haunted. And it's not, really. The White House doesn't have a poltergeist; more like a gentle guardian spirit. President Lincoln is supposed to walk the halls of the White House, peeking in on how his successors are doing. 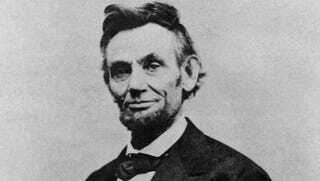 The mysticism of Lincoln in The White House began with Lincoln himself. He and his wife held seances there, after losing their son. The 1860s were an age for spiritualism, and mediums regularly visited the place. During one session, a medium reportedly channeled Daniel Webster and told Lincoln to free the slaves. After Lincoln's assassination, Mary Todd Lincoln was said to use seances to contact - she said successfully - Lincoln himself. The practice of White House seances was continued by President Grant, who claimed to have spoken with Lincoln's son, though not to the President. After this, the ghostly contact sessions died down, and the people who saw ghosts saw them by chance alone. Queen Wilhelmina of the Netherlands was said to have fainted after hearing a knock on her door and opening it to see Lincoln's ghost. But the one who claimed the most extreme encounter was (who else?) Winston Churchill. Churchill was staying in the Lincoln Bedroom during World War II. He was said to have hopped out of a long bath, and walked naked into the main bedroom, only to see Lincoln leaning on the fireplace. (This, by the way, is the second significant event that happened to Churchill, during World War II, during a bath.) The two looked at each other, obviously both feeling a little vulnerable, when Churchill reportedly said, "Good evening, Mr. President. You seem to have me at a disadvantage." Lincoln's ghost supposedly smiled a little, and faded away in embarrassment. Churchill refused to stay in the bedroom after that. He did not, however, give up long baths. Via Paranormal Knowledge and White House Ghosts.